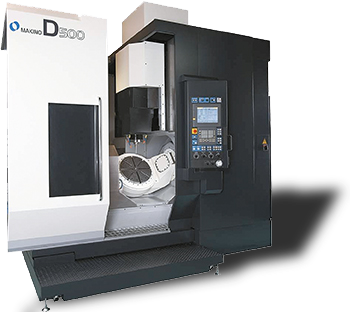 The D500 is aimed at the aerospace supply industry, premium job shops and die-and-mould manufacturers. The customers targeted in the aerospace supply industry are manufacturers of jet engine components such as blisks, impellers and blades (200-500 mm). primarily involve index machining (2- and 3-axis) with a special focus on deep cores/cavities and providing fast acceleration and precision in simultaneous 5-axis machining, even for heavy workpieces. Customers in the aerospace supply industry will benefit from reduced blade machining times thanks to the high acceleration and deceleration performance of the rotary table. This is particularly beneficial in blisk and impeller machining where leading-/trailingedge reverse motion speed is the key. 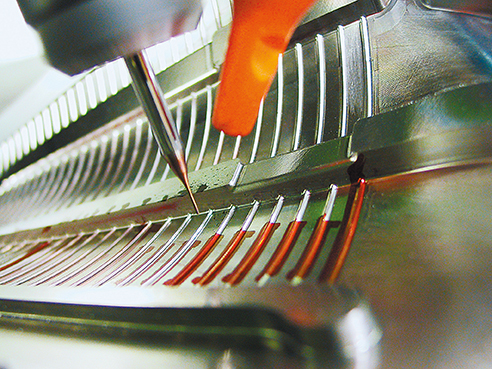 Premium job shops are faced with frequent model changes, tight reprogramming times as well as numerous positioning and indexing operations and on-machine manual inspection times. Their requirements are for a machine that is easy to program for one-off prototypes and offers high positioning accuracy, good visibility from an operating eye view and an easily accessible working chamber. The D500 meets these requirements. It delivers high positioning accuracy thanks to the short distance between the A-axis pivot point and workpiece location. The operating station directly faces the A-axis and the walk-in splashguard enables the operator to enter the machining chamber more easily. What’s more, the pallet changer is positioned directly opposite the operator’s station, a design that does not affect the ease of working even in automatic operation. Last but not least, die-and-mould manufacturers will benefit from the minimisation of level differences at seams in index machining and the ability to move heavy workpieces and enjoy fast acceleration in simultaneous 5- axis machining. 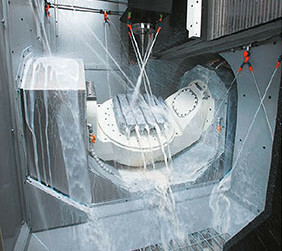 Significant reductions in rough machining times, improved tool life and enhanced surface finished are to be expected. motors bring the benefits of fast acceleration and highspeed rotation, enabling the A-C axes to fully follow the linear X-Y-Z axes, even with a maximum table load of 350 kg. By positioning DD motors on both sides of the tilting axes, the Makino design engineers have prevented torsion on the tilting axis and optimised the distribution of torque. 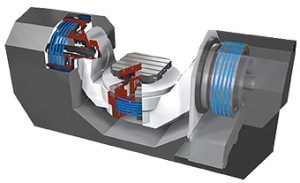 The trunnions supporting the cradle are designed with a fully coaxial layout and have a split structure that allows assembly adjustments, which substantially improves machining accuracy. 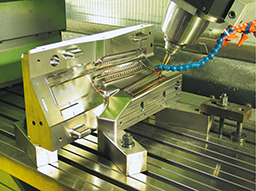 The issue of thermal control is critical to a machining centre’s accuracy over time. Here, Makino has come up with a number of smart solutions to the heat problem. Both the spindle and feed axis are temperature controlled while key cast-iron components, e.g. the column and bed, are insulated against ambient heat. 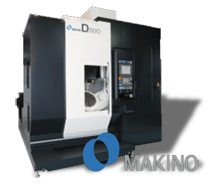 Moreover, Makino’s unique spindle coolant system and cooling oil encircling the DD motors prevent a heat-induced loss of accuracy. The D500 comes with a number of spindle variations. 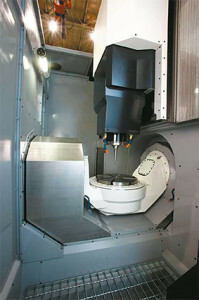 The high-speed spindle is a 20,000-rpm HSK-A63. Since the issue of automation in parts machining is increasingly critical, the D500 is designed to be readily compatible with a pallet changer, pallet magazine.